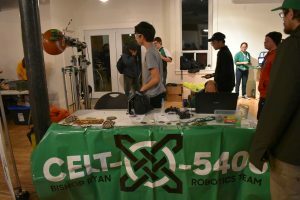 This past Friday night, Nov 09, 2018, Celt-X took our robots, Tipsy and Oscar for a little jaunt down the road in the neighbourhood! This month’s James Street Art Crawl held a Mad Science Fair at The Spice Factory, 121 Hughson Street. So proud of our students and mentors. We set up in no time and had tons of people asking all sorts of questions about our robots, our team and our successes to date. 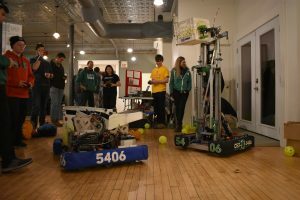 We had rookies and 2nd year students driving our robots around our space and shoot balls into the air like pros! They also jumped right in and chatted up the onlookers! We even had folks come back to say how well the kids were doing. A fantastic night, even if the weather had rained on our parade – our original plan had been to let the robots loose and drive themselves up the street to the make a grand entrance – but mother nature and father winter could not agree and we had to drive the bots in cars instead. We even had a few combat bots show up too! A dust pan and brush, pumpkin and skull, to name a few!